Hi Parham, firstly thank you for the interview. Let's start with your background. A - I was always interested in making computers more intelligent, and the best way to do that was to enable them to hear and see better. This motivated me to focus on signal and image processing, as well as data processing algorithms in general. A - The first data I remember working with was a set of analog readings from an exercise bike that I connected to my computer in order to create a very crude augmented reality exercise bike. I was 13 at the time. A - The true "aha" moment came a few years ago. This was the moment that my team and I realized the power of data and that it could actually solve relevant problems. For years, many companies and researchers had been exploring facial skin-tone detection systems that would tell you your true skin pigment. The hard part with this is that your skin will look vastly different in photos (and sometimes, in real life) due to different lighting and facial tanning conditions. We tried a simple idea. What if you analyzed hundreds of photos of a person over many years instead of just a few photos? Could you remove the lighting noise or errors and find the true tone of a person's face? The answer turned out to be an astounding yes. By scanning hundreds of tagged Facebook photos of a person, we could accurately detect their true skin tone. We were surprised how well this worked. Parham, very compelling background. Thank you for sharing. Next, let's talk about your work in Visual Information Extraction. Q - What are the main "types" of problems being tackled in the visual information extraction space? Who are the big thought leaders? A - The biggest problem is to identify objects in images and categorize them (i.e. find out a cat vs. a person vs. a tree). There are many researchers working on this including our research group at the University of Toronto. Q - What have you been working on this year, and why/how is it interesting to you? A - This year my team has focused on a number of project, but the most interesting has been "understanding" relationships based on location of tags in images. It is a simple idea, that whoever you stand beside when you take photos is more closely affiliated with you. In practice, it results in very interesting relationship graphs which often mimic the real-life family or friend structure. There are other projects that we are working on, including detecting heart signal shapes from color changes on a person's face, or detecting cancerous moles by visually analyzing skin. However, the latter projects are still ongoing. Very interesting - look forward to hearing more about the ongoing projects. Let's move on to talk about what you are building at ModiFace. Q - Firstly, how did you come to found ModiFace? A - We had been working on lip reading and lip tracking systems for years, when interest from a cosmetics brand resulted in us applying our lip detection to lip enhancement and visual alteration. This was in 2006 and from there ModiFace was founded. Q - What specific problem is ModiFace trying to solve? How would you describe it to someone who is not familiar with it? 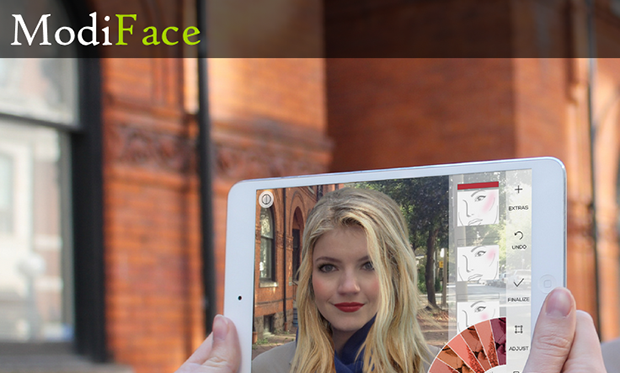 A - ModiFace technology simulates skin-care and cosmetics products on user photos. So, a skin care product that reduces dark spots, or a shiny lipstick, or a glittery eyeshadow ... we specialize in making custom simulation effects for all facial products. This is us as a core. From this technology we have built a variety of apps for popular beauty brands (like L'Oreal or Vogue magazine), as well as ModiFace-branded mobile apps for consumers which have been extremely popular (with over 27 million downloads to date). Q - What do you find most exciting about the intersection of technology and beauty/fashion? A - First, it is an open space. There have not been too many signal processing scientists tacking problems in this area, which makes it interesting. Finally, consumers who are deeply engaged with beauty/fashion are very tech friendly, and open to new technologies. All of these elements combine to make an area ripe for disruption. Q - Which ModiFace applications/technologies have been most successful? A - Our core technology which consists of simulating makeup and skin-care/anti-aging effects is at the heart of what we do. Q - What else should we know about ModiFace? A - We are the largest mobile beauty company on the planet with 27+ million mobile downloads. Not a lot of people know/realize this about us. Sounds like things are going very well - long may it continue! Parham, next, let's talk about you a little more. .
A - By far, ModiFace. It is an interesting company at the intersection of mobile, beauty, fashion and technology. But the team that has come together over the last 7 years is what makes it truly special. Q - What mistakes have you made (if any!)? A - Many. There have been projects that we have pursued that were dead-ends. For example, I created a multi-camera image searching company ten years ago which was technically neat, but offered a solution that no one really wanted. The company didn't work. There are many examples like this. But as long as you learn from your mistake, you look at them as steps towards a positive outcome. Q - What distinguishes your work from that of your contemporaries? A - That is a hard question to answer. Everyone pursues directions based on what motivates and excites them. My career path has been perhaps a bit different in that it has this blend of entrepreneurship and academia. Most eventually settle in one of these, for good reason. I have tried to make the two fit together in synergy. Time will tell if this was yet another mistake, or an unorthodox but synergistic equilibrium. Q - What publications, websites, blogs, conferences and/or books do you read/attend that are helpful to your work? A - There are many signal processing conferences/journals. I also read the popular tech blogs on a daily basis, and of course daily news like CNN. That is an essential part of my morning routine. Q - How important is data in your personal life? A - It is hard to answer this one. It is perhaps fair to say that personally, I am driven more by gut feelings than data. Q - What does the future of Big Data / Visual Information Extraction look like? A - It will be both exciting and scary. Computational image understanding will get better, and sooner or later Facebook and other social networks will know everything about us, from our relationships to what we like to do. This much information at the hands of a few companies will eventually be cause for concern, but so far our loss of privacy has been inch by inch which has been hard to notice. Q - What is something a smallish number of people know about that you think will be huge in the future? A - The impact that mobile apps, especially data processing and intelligent apps, will have on our society. Everything from how we study, to how we treat diseases, to how we shop, will change. But we are just beginning this process ... much more awaits us in the next few years. A - Pick problems that in your view truly matter. Too often, we find ourselves pursuing goals that deep down we don't believe in, and this will only lead to failure or unappreciated success. Parham – Thank you so much for your time! Really enjoyed learning more about your research and what you are building at ModiFace, as well as your career to-date and your views on the future of Data Science. ModiFace can be found online at http://modiface.com and Parham Aarabi @parhamaarabi.